這篇是小周媽 2016 年帶著三歲半小周, 到 佛州奧蘭多迪士尼 十天的攻略. 迪士尼在 Walt Disney World 的軟硬體系統投資了許多的新功能, 因此許多攻略是前幾年到 奧蘭多迪士尼 還沒有遇過的. 這篇主要是住宿與吃飯 (Dining Plan) 的部分. 當然不一定. 如果是佛州迪士尼, 很建議大家訂迪士尼自己經營的飯店 (Disney Resort). 若是加州的話, 因為很多旅館就在樂園外面, 住外面是可以考慮的. 在佛州迪士尼, 住迪士尼旅館不但有地利之便, 往來迪士尼飯店與樂園間的接駁車有專用道. 旺季時候, 外面進來的車子都在排隊進樂園, 飯店的接駁車是不用排隊直接進到樂園內的. 另一個好處是 Magic Hour, 通常每天會有一到兩個樂園, 在開園前一小時或關園後一小時有 magic hour. 這時段樂園裡所有的 ride 都保留給住宿客人使用, 人潮會少得多, 是除了 fast pass 之外可以坐到熱門 ride 的機會. 最後一個我很喜歡的好處是免費機場接送服務 (magical express, FAQ 請看這裡), 如果你只是一趟要到奧蘭多迪士尼, 沒有要去其他地方, 租車費都可以省了. 小周媽有介紹過佛州奧蘭多迪士尼外面買打折票的選擇, 像是 undercover tourist (文章請按此), 所以想省點錢的話, 可以訂迪士尼的飯店, 然後票在其他地方買. 但如果你決定要買套裝(住宿跟門票一起買, 像是 Magic Your Way Package), 就可以加買 dining plan. 假設你的套裝是買五天, dining plan 一定要買五天, 不能只買三天, 而且全部的人都要買(除了三歲以下小孩), 不能四個人一起訂套裝行程, 只買兩個人的 dining plan. 如果同行的有三歲到十二歲之間的小朋友, 他們的 dining plan 比較便宜, 但是他們在 table service 點餐的時候, 只能點 kids menu 上面的東西, quick service 則沒有差別(大部份 quick service 沒有 kids menu). Quick Service and Table Service 是什麼? 這裏要解釋一下 quick service 跟 table service 的差別. Quick Service 是自己點餐, 自己領餐, 然後自己找位置坐的. 很多迪士尼飯店附設的餐廳, 像是 All-Star Sports 樓下的餐廳, 還有樂園裡面自己點餐的地方, 都是屬於 quick service. Table Service 是有人帶位(也建議先訂位), 跟一般餐廳一樣, 有服務生點菜送菜, 也要給小費的餐廳, 所有 character dining 都屬於 Table Service. 好處1: 如果你的 dining plan 有 table service, 可以事先規劃吃飯的地方, 因為有 table service 的餐廳都可接受訂位. 好處2: 許多的 character dining 可以使用 dining plan 的 table service 點數. 如果買 dining plan 大約是省 20% 左右, 但要注意有的需要 2 table service 點數, 像是受歡迎的 Cinderella Royal Table 就需要兩個 table service credits. 按網頁右邊 “Some Dining Plans Accepted” 就會看到要求的點數, 沒有的話表示這間餐廳不接受 dining plan. 在所有的 table service 餐廳裡, 小周媽覺得最值回票價的是 Hollywood Vine 的 Minnie’s Seasonal Dine at Hollywood & Vine Dinner Fantasmic! 這個名稱很長, 是吃一餐 character dining , 還附 Fantasmic VIP seat 的意思, 而且只需要 1 table service credit, 原價可是 $$$ 的餐廳哩! 好處3: 比起一餐餐自己買會便宜一點. 當然最便宜是自己帶食物, 但我不可能拖著十天份的食物上飛機, 在樂園裡面吃飯是免不了的. 既然大部份都要在園區內吃, 乾脆買 dining plan. 園區與飯店內的餐廳列表請按此, 右上角有 Dining Plan Accepted 下拉表單, 可以用 dinning plan 類別過濾出可以接受 dining plan 的餐廳. 所有 dining plan 都會附 resort-refillable mug, 就是飯店樓下餐廳可以無限暢飲的杯子. 早上到樂園前, 可用這個杯子在飯店吃早餐的地方裝飲料. 這個杯子無法在樂園內無限暢飲, 只能在飯店餐廳內. 因此通常會在飯店吃早餐後, 出發到樂園之前裝滿帶著. 如果累了提早回到飯店房間, 飯店附設餐廳還開著, 也可以再拿去裝飲料. 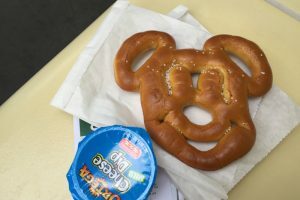 當你買了 dining plan 之後, 記得到 My Disney Experience 裡面, 把你的 dining plan 連結到手環. 在餐廳吃飯的時候, 是用手環刷點數的. 如果你買的有 table service, 在 link dining plan 之後, 還要另外為 table service 的餐廳訂位, 不訂位也可以, 但旺季的時候強烈建議先訂位. 打電話是很方便, 不然網上查詢各餐廳的空位時間也是很方便的. 先到這裡, 上面選日期, 用餐時間, 人數(三歲以下小孩也要算, 雖然小朋友不一定要點餐), 然後按右邊 “Search Times” 綠色按鈕, 就可以看到目前可以訂位的餐廳與訂位時間. 在旅館樓下, 有簡單的商店可以買食物與日用品, 像是零食, 牛奶, 瓶裝水, 藥品等. 當然紀念品選擇也很多樣. 如果你是 Amazon Prime 會員, 可以考慮用 Amazon Pantry 買些東西直接送到旅館房間, 很多受歡迎的食品像是 KIND Healthy Grains Granola Bars, freeze-dried 水果, Honest Kids organic juice (這個我最愛, 扛上飛機好重) 等等, 都可以從 Amazon Pantry 買. 小周媽就是訂 2 quick service 的 dining plan, 然後這些健康點心直接送旅館房間, 解決一般吃的問題. 然後另外訂一兩個 character dining, 與表演+吃飯套裝行程, 付原價. 本來也是有考慮訂 1 table service + 1 quick service + 1 snack, 但我們家是不重吃的旅行方式, 覺得每天都要 table service 太花時間, 在計劃行程的時候, 有點為了 table service 餐廳能訂到的位置而去計畫當天要進哪個樂園, 所以後來還是改訂 2 quick service. 用手機查就可以知道旅館附近的 Target 或是生鮮超市在哪. Target 並不是每一間都有賣生鮮, 去之前可以打電話問一下. 坐 Uber 要記得帶著 magic band 出門!!! 這樣 Uber 帶你回旅館的時候, 旅館外面的警衛才會讓 Uber 進來, 送你到旅館門口. dining plan 是點數, 沒有規定一天只能用一個點數. 假設到迪士尼五天, 買了 Disney Dining (1 table service, 1 quick service, 1 snack), 表示我的 table service 總點數是五點, 我可以第一天都不用, 第二天把兩個 table service 點數用在中餐與晚餐, 這樣大家了解我的意思吧~ 看你訂幾天, 到樂園的那天就會把點數全部給你(都存在你的 wrest band 上面), 然後自己決定怎麼用. 4. 是的, 只有住宿跟門票一起在迪士尼官網買, 才可以加買 dining plan. 不是每一間都在園區裡面喔, 有的是在 resort 的樓下, 有的在 shopping area. Your credit card is being used to guarantee this reservation. Please cancel your reservation within the location’s allotted cancellation period to keep from being charged. 沒有喔, 兩個園區是不同公司. 我之前都是直接叫計程車. 現在 Uber 這麼方便, 叫 Uber 就可以了.